This robust Homemade BBQ Sauce is easy to make and dripping with bold flavors. Slather it on ribs, chicken, and all of your barbeque favorites! Combine all ingredients into a saucepan, stir to combine, and gently simmer for 10 minutes. Allow to cool slightly, pour BBQ sauce into mason jar, cover with lid, and store in the refrigerator overnight to allow flavors to meld. 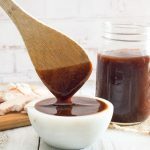 If you are in a hurry, you can enjoy this BBQ sauce right away rather than letting it rest in the fridge overnight, however the flavor will be better in ANY BBQ sauce recipe that sits overnight. THIS BBQ SAUCE would taste great on my BBQ Meatloaf recipe!